They placed him on a bier and tended his bruises and the flow of blood from his elbow. Bandaged and victorious, he was carried into the Temple of the Jaguars from where, elevated high above the level of the Ball Court, he was invited to watch the start of the new game, below. He wondered if this was just for him; wondered if his presence in this harvest of spirituality was an extension of the grace as witness… or whether the difference in time and place didn’t matter, that condition and readiness were everything, and, once fulfilled, the dawning horizon’s fingers of purpose would weave their anciently-spun magic, no matter what the era in which they were invoked. They gave him water for his parched body, then a sweet liquid that contained a contrasting brew of bitter herbs. When he woke, it was much later, and very dark. He relieved his body and removed the plain, white robe in which they had dressed him. 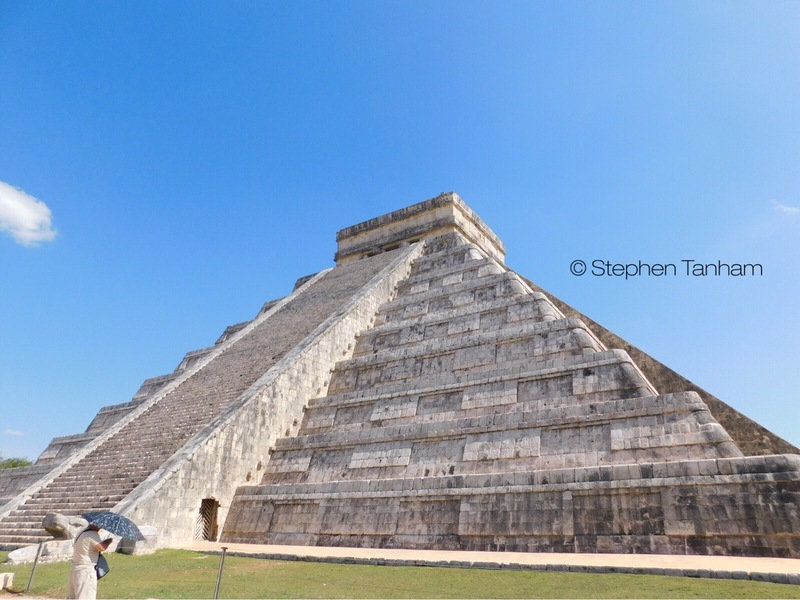 He bathed and put on the laid-out robes of the Warrior, the single human priest that the process of Chichen Itza was designed to create – or, rather, recreate. When he descended the steps, there came a hissing noise, like that of a snake. Listening and smiling, he realised that it came only from the priests’ natural breathing and a narrowed throat, They were greeting him in the most revered way they knew. They directed him to sit on a ceremonial chair placed on the bier and garlanded with flowers. The candles they set around him made a light greater, even, than theirs. In silence he was led from the Temple of the Jaguar, a master now of his lower nature, and opened to the higher. They carried him past the Temple of Venus, stopping to acknowledge it to the left and the pyramid of Kukulcan, waiting unlit, to the right. There was a sense of return in that gesture, though his mind could not grasp it, yet. The unvisited western stairway, with its ninety-one steps, sat like the world’s biggest jaguar in the darkness, watching him. The giant building ahead was the Temple of the Warrior. He knew it to be so without asking. The Sun had come through the stone circle to claim the ball struck by the accurate elbow of the Newfound. What followed must reflect that on a more cosmic scale… Three of the priests flanked him with large candles as he climbed the many steps to the platform of the Chac Mool – a stone figure lying on its back with shoulders and knees raised, its hands supporting an unseen object with upraised palms. The Feathered One whispered into his vision… and he understood. 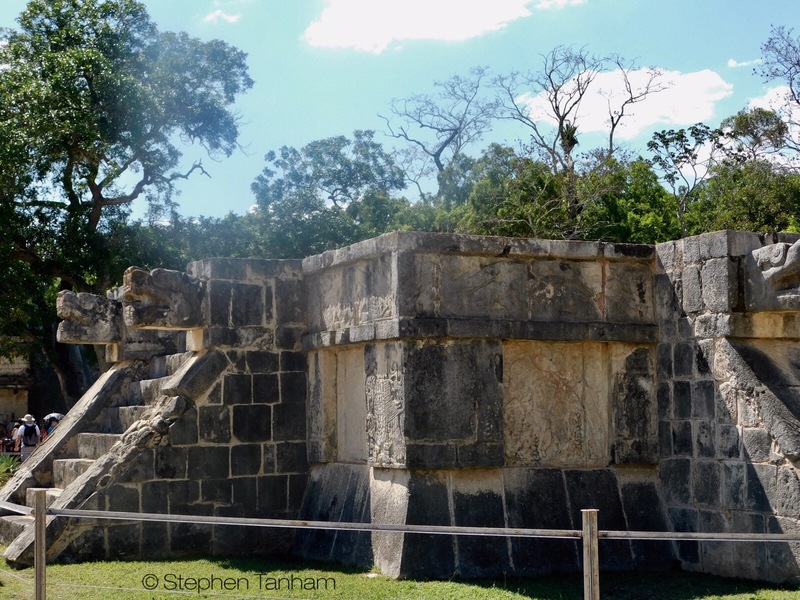 He smiled away the tears and returned to the embrace of his fellow priests who broke their silence and carried him – this time without the bier – into the heart of the Warrior Temple, beneath the Chac Mool. There was drinking and feasting, but most of all, there was rejoicing. The air would be clean, the waters would fall from the sky – Chac, the God of Rain would bring it. 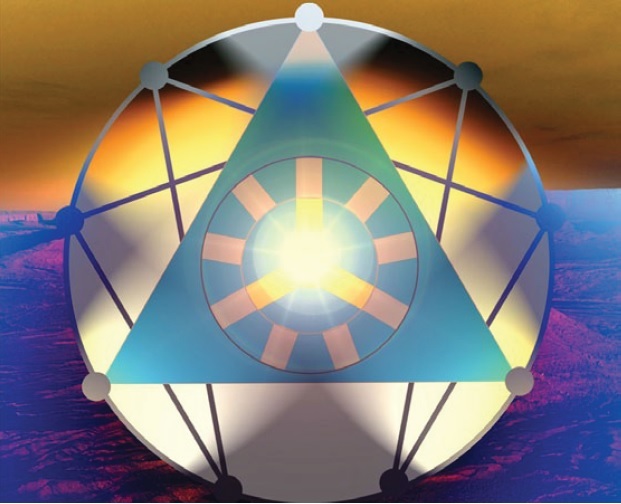 Only the seed of life, itself, now needed to come down from the sky. The dawn came fully, bright and fruitful in the spring sky. It rose cleanly between the twin giant serpents that flanked his body, lying behind the stone figure of the Chac Mool, nearer the sunrise. As the sun cleared the upper stone surface, his hands were offered and steady, and a huge sigh came from the thousands below who saw him hold the solar disc, if only for the duration of a heartbeat. His eyes shone, now, this Child of the Sun. No longer human but not yet a god. The Newfound had gone, his atoms scattered by the Sun’s energy as petals of hope among the crowd. Those who watched him descend from the Warrior Temple would see his feet barely touch the smooth stone. As he strode across the brightening plaza all made way, many frightened of the depth of the light before them. To all of them he radiated love, only love. Still alone, he climbed the steps of the small Temple of Venus. The bier was there; once more garlanded with flowers and surrounded by an ocean of candles – candles that were now unnecessary. The temple held only one more object – a stone chalice of dark liquid. For hours, he watched the Sun climb along its course. 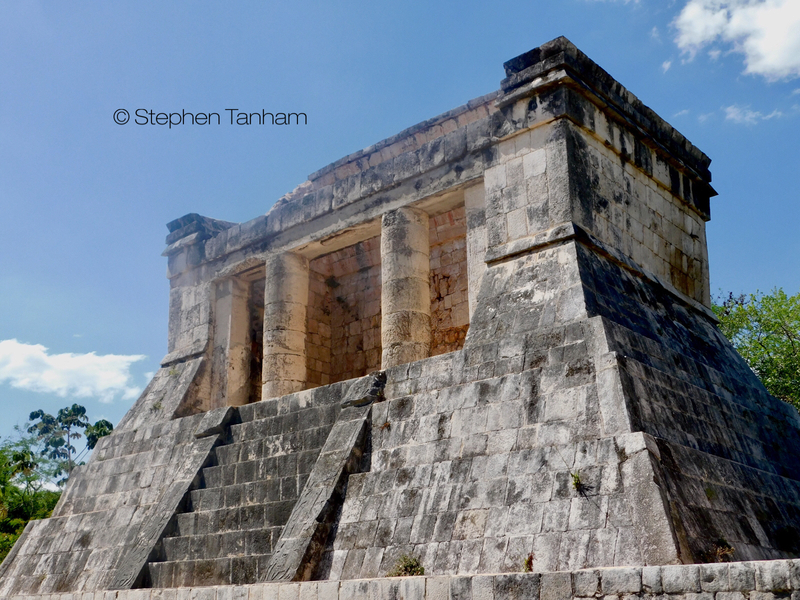 When it was nearly overhead, he stood and raised the drink to Kukulcan waiting in the centre of the temple complex. They watched, weeping with both joy and sorrow, as he refused the bier and dragged his dying body up the south stairway of Kukulcan. At the top, he staggered the final step into the cube and sat down on the stone throne reserved only for the ascending Warrior, the man of perfection. His body died then. But his eyes shone through the stone and up to the giant feathered serpent that had come for him. With claws that passed through the stone he was lifted beyond the heavy and carried down the stairway in a time behind time. To those below, the spring solstice made the pattern of the snake as the day progressed, sliding its segments down the pyramid to greet its carved likeness, below. In the fields around the temple, snake skins – shed and left behind – would be found this day to mark the return of fertility to the land. The year would be fruitful. But the Newfound, now the Newborn, was long gone… though his reality remained. Wow…I was waiting for special and found it to be amazing. Such depth of imagery… truly magnificent Steve! From the point of view of Karma,I think I must have done something good somewhere in a distant past,that am so rewarded with meeting you and coming into the School. The tittle of one of the James Bond novels of the sixties, if I remember well is ” Diamonds are Forever”.I consider some meetings are diamond, like this one and so are forever. LOL, brave Warrior, Bravo.